A bold sculpture specially designed to be visible on satellite imagery has been installed at the new gateway to one of the country’s leading science parks. The entire structure, created by inflating and stretching stainless steel, has been designed and made by Newcastle-based Full Blown to provide a “dynamic eye-line view” as you enter the North East Technology Park (NETPark) in Sedgefield, County Durham, which is home to an array of innovative, fast-growing companies working in high-tech, global markets. CDEMN member Impress Group was involved in the project. 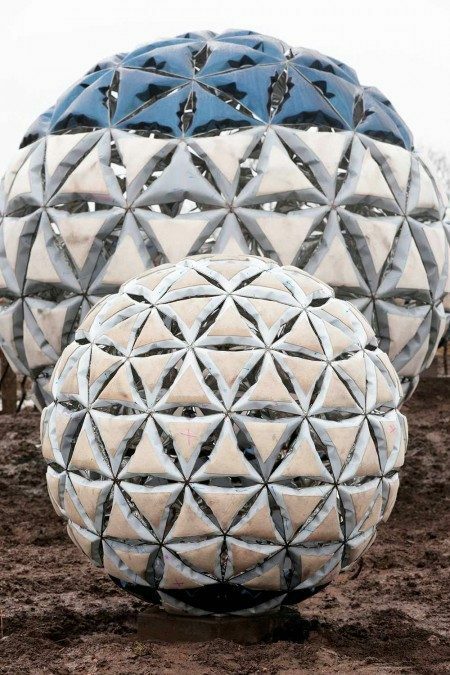 When photographed from space, the five inflated metal spheres that make up the impressive Synergy sculpture emulate the logo of the technology park. The work was commissioned by NETPark to showcase the new entrance to the 26-acre Phase 3 development to the north of the park, which opens up development land for science, engineering and technology companies looking to locate on the park as part of the 10-year development strategy, creating 3,000 jobs and adding another £400m to the region’s GVA. Brian Archer, managing director of Business Durham, which manages NETPark on behalf of Durham County Council, said: “NETPark is a global hub for dynamic, cutting-edge companies making innovative products that transform our lives. The Synergy sculpture features four small 300kg spheres and one larger, 700kg central sphere all made from stainless steel, with a blue mirror finish and colour changing LED lighting to provide a more dramatic effect at night. Full Blown director Kate McDonnell said: “Each sphere is positioned at different heights to provide a dynamic eye line view, so as you enter the site you get different views as you move round the sculpture. Full Blown, which also crafted NETPark’s six-metre Plexus sculpture ten years ago, created Synergy’s spheres using its patented and unique inflated stainless steel.